Yesterday, Google France launched the second edition of "Les Heures Magiques" ("The Magic Hours"), created with 72andSunny Amsterdam. 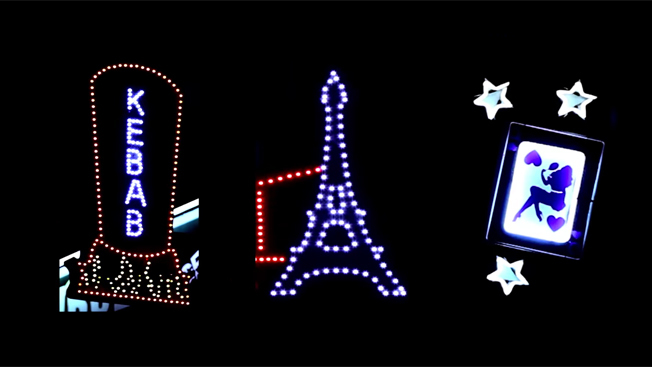 For 31 nights, the interactive, mobile-first campaign will invite Parisians—and tourists—to rediscover the City of Light with a variety of after-sunset activities. Activities include a lit-up bike ride through Paris' darkened streets, insect-based cooking (cleverly dubbed "Crunchy Crickets"! ), an underwater music show, and a neon safari, where you can tour the retro neon signs that color Paris' bars and clubs. (Check out short videos promoting each event below). The campaign is a charming way to experience the vibrant, creative dynamism of Paris, which is often written off as a dying museum city. It's also one in a number of recent efforts to reinvigorate interest in city activities; others include last month's no-car day, initiated by Mayor Anne Hidalgo, and Airbnb's Halloween sleepover sweepstakes in the Catacombs, dubbed by some as the Empire of Death. To access the program, visit the Magic Hours website via mobile, where you'll find different activities nested within Google Maps. The mobile positioning is practical for both non-locals and townies; France has among the highest smartphone penetrations in Europe, with 81 percent of people from 18-24 carrying one, and 26 percent of 60-69-year-olds as of last year. Parisians will also see a lot of social coverage, courtesy of WeAreSocial. Partners include the City of Paris, and various lifestyle publications like Paris Zig Zag, Society and Fricote. Locals can share their favorite activites via the #HeuresMagiques hashtag for a chance to be featured on the site. To learn more, check out the Magic Hours case study from its last installment.